If your organization is one of the 95% of enterprises that operate in the cloud, you are already grappling with cloud security. And if your organization is one of the 85% of companies that use multiple Infrastructureas-a-Service (IaaS) and Software-as-a-Service (SaaS) clouds, you have additional issues to consider. Compared to the days when organizations managed everything on-premises or only had a handful of cloud deployments, this new multi-cloud world exacerbates the expansion of the attack surface and makes threat containment and accountability more difficult. Further, pressure on security teams to protect everything in the multi-cloud environment is leading to reactive and expensive threat management. If you are a security leader tasked with meeting the challenges of a multi-cloud environment, eventually you’ll find that siloed cloud security strategies fall short of the mark. But don’t wait. Now is the time to consider a holistic security approach that reclaims control from disparate cloud security functions, and gives you the means to see your entire corporate security posture clearly so you can manage it more competently. 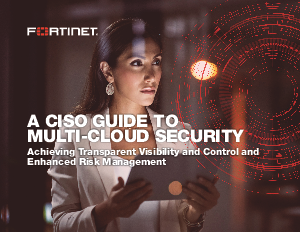 You can achieve this through a security fabric approach, using a comprehensive suite of threat prevention, detection, and mitigation tools that integrate with all the major cloud services and can be managed within the enterprise from a single pane of glass.